Time really flies! 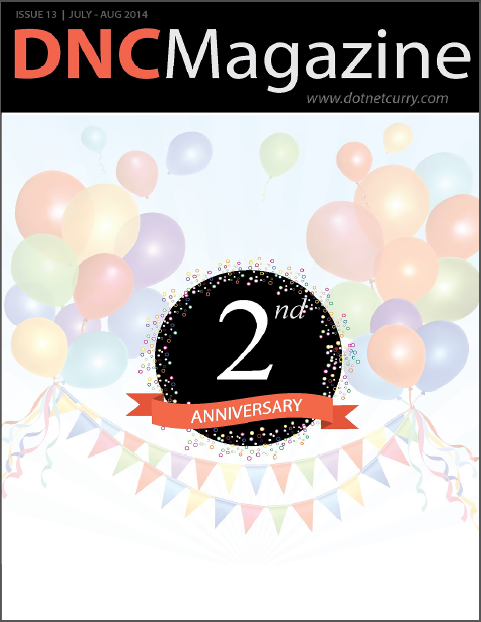 Hard to believe that it’s already 7 years since we started DotNetCurry.com and 2 years since we started DNC Magazine. Yes, it is our Anniversary and everyone’s welcome to our virtual party! In this anniversary edition of the DNC Magazine, we teach you how to create cool WPF Charts using a free charting library and how to implement MVVM in WPF. For our mobile app developers, we are featuring articles on Cross-Platform Mobile development and Image Manipulation on Windows Phone. For our Web Platform Developers, we introduce you to ASP.NET vNext, walk you through External Data access techniques using SharePoint BCS and show you how to chain async functions in jQuery. In our regular Software Gardening column we talk about version control and in a separate article, discuss Agile in VS 2013. Last but not the least, we have a unique article showing you how to create Node.js apps in Visual Studio along with Express.js and MongoDB. Once again, we thank our fabulous contributors Craig Berntson, Filip Ekberg, Mahesh Sabnis, Pravinkumar Dabade, Ravi Kiran, Subodh Sohoni, Suprotim Agarwal, Vikram Pendse and our technical reviewers without whose time and efforts this issue wouldn't have been possible. For you, it's time to win some prizes! Our Fantastic Sponsors have put up some fantastic prizes to to celebrate DNC Magazine’s 2nd Anniversary and DotNetCurry’s seventh year on the Web. You can learn more about each products by clicking on the product links. Infragistics is a worldwide leader in user experience helping developers build stunning apps, Infragistics is trusted by over a million developers for enterprise-ready user interface toolsets that deliver high-performance applications for Web, Windows and mobile applications while also offering design tools for rapid, interactive prototyping. Fortune 500 companies increasingly rely on Infragistics iOS and Android apps including SharePlus, the universal mobile interface for SharePoint, and ReportPlus, the first self-service dashboard and reporting app, to enhance productivity of business users on the go. Along with leading-edge software, Infragistics offers expert UX Services and award-winning support. Since 1985, Melissa Data has been a leading provider of data quality and address management solutions. Melissa Data’s data quality software, Cloud services and data integration components verify, standardize, consolidate, enhance and update U.S., Canadian, and global contact data for improved communications and ROI. The winners will be announced by August 20th 2014 (earlier August 10th) and please allow time till September 15th 2014 to deliver the prizes! You may still subscribe as the magazines are absolutely FREE! The Giveaway has Ended. Winners have been announced against each prize they have won. The winners were selected randomnly. Some prizes were selected randomly for all those who left a comment. Hope you all enjoyed the Giveaway and for those who could not win, please don't be disappointed as the magazine itself is a prize! All Winners will be contacted by August 30th and please allow atleast 15 days after that to send you the prizes. How Do I Win These Cool Prizes and Subscribe for Free? To enter a chance of winning a prize in this Giveaway and to subscribe to all Editions of this Free Digital magazine and our Newsletter, just enter your email address in the text box given below and hit 'Subscribe'. Confirm your subscription by checking your email and enjoy all the magazines as well as our .NET Tutorials, right in your inbox. No Spam, no nonsense. Just .NET and related stuff! If you want to say something good or something not-so-good about the magazine, please use the Comments section. You can even list your favorite prize in this Giveaway! Who knows, you might just get lucky! The GiveAway will end on the 20th of August, 2014 (extended by 10 days) and all winners will be declared here and subsequently contacted via Email. Good luck! If you are already a subscriber, you are eligible for the Giveaway automatically!